In 1817 the Bank of New South Wales was established. The first issue of banknotes comprised five shillings, ten shillings, one pound and five pounds and paper tokens for one shilling, one shilling and sixpence, two shillings, and two shillings and sixpence. In 1825 the British Government imposed the sterling standard throughout its Empire and English coins were minted in Australia. In 1901, following Federation, the British silver and bronze coins continued in use but in 1910 Australian Commonwealth siver coins were introduced. In 1911 bronze pennies and halfpennies were introduced. In 1913 the first series of Australian notes was issued, based on the old British sterling system. 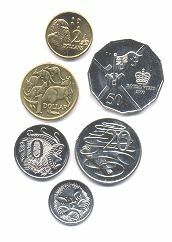 Decimal currency was introduced on 14 February 1966. Dollars and cents replaced the pounds, shillings and pence. The new coinage consisted of silver and bronze. In 1996 Australia's paper based notes were converted to polymer in an effort to prevent counterfeiting. 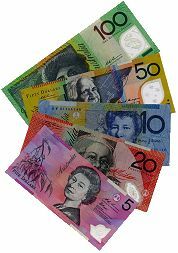 The technology which produced the notes was developed in Australia. The 5c, 10c, 20c and 50c coins are made of 75% copper and 25% nickel. The $1 and $2 coins are made of 92% copper, 6% aluminium and 2% nickel. The $100 note features Dame Nellie Melba (1861-1931), world-renowned soprano, and General Sir John Monash (1865-1931), civil engineer and distinguished soldier. The $50 note features David Unaipon (1872-1967), Aboriginal writer and inventor, and Edith Cowan (1861-1932) first female Australian politician. The $20 note features the Reverend John Flynn (1880-1951), founder of the Royal Flying Doctor Service, and Mary Reibey (1777-1855) former convict, pioneer businesswoman. The old $5 note features Queen Elizabeth II, and Parliament House. The new $5 note features Sir Henry Parkes (1815-1896, politician and architect of Australian Federation, and Catherine Spence (1825-1910) writer and feminist. All Australian coins have the portrait of Queen Elizabeth II on the front. The reverse side of $2, $1 and 50c coins frequently feature commemorative designs. The $2 coin was introduced in 1988 to replace the $2 note. It features an Aboriginal tribal elder, the Southern Cross and native grass trees. The $1 coin was introduced in 1984 to replace the $1 note. It features kangaroos on the reverse side. 50c coin features Australia's Coat of Arms. 20c coin features the platypus (soon to be replaced with an image of Sir Donald Bradman).